The Agrison 45hp Ultra Tractor has a number of features that other compact tractors in its price range do not. Hydraulic up and down proves to be a winning addition for Agrison’s 45hp Ultra Tractor. The Agrison 45hp Ultra has gained a reputation as a versatile compact tractor, in what has become a highly competitive under 50hp market in Australia. 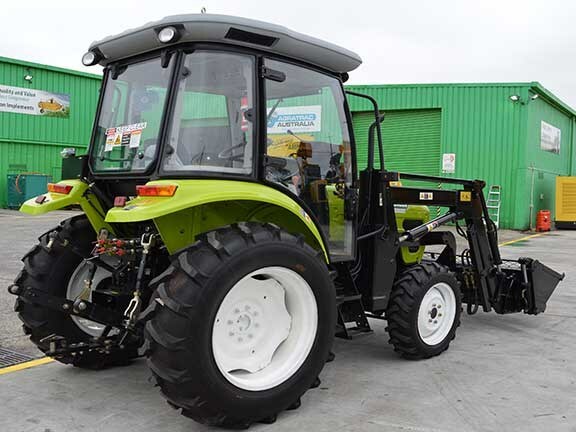 Agrison has rapidly grown and expanded over the years, with a five acre premises in Melbourne’s northern suburbs housing a huge range of tractors, tractor attachments and other farm machinery, and an extensive range of spare parts kept in stock at all times. The 45hp Ultra Tractor series is one of Agrison’s most popular models and has been designed to offer reliability and productivity for farmers in Australian conditions. The Ultra is equipped with a four in one front end loader with quick release from the bucket, 600kg lifting capacity, four cylinder three-point linkage, power steering, 28 LPM hydraulic flow, four remotes, wet disk brakes on two discs, night lights and importantly a high level of fuel efficiency. Agrison’s Melbourne-based operations manager Sol Ozkaya says the Ultra has a lot of features that most other compact tractors in this price range don’t, and that it is the cheapest new cab tractor available in Australia, which also comes with quality value-adding features as standard. The spacious, European-style, fully enclosed bubble cabin, flat floor and noise-deducing floating cab help to keep the driver comfortable and Ozkaya says the Ultra is ideal for hobby farmers or virtually anyone with an acreage that wants a well-priced tractor that comes with quality value-adding features as standard. "People love these tractors, because they are reliable and easy to operate, and easy to service, you don’t need to hook them up to a computer to do maintenance on them," he says. "The handles for the bucket and front end loader are also nice and accessible. "They also come with a 2WD setting, a 4WD setting and a diff-lock." The fact it has hydraulic up and down, is a big attraction to lot of farmers, according to Ozkaya, because it allows the Ultra to perform tasks that a lot of other compact tractors cannot. "The major one is that its three-point linkage is hydraulic up and hydraulic down, whereas everyone else is gravity feed down," he says. "The advantage of this is that, if for instance you’re using a post-hole digger to put in new fence posts, you can hydraulic the post up and down and work it into the hole with the hydraulic ramps pushing it down. "Whereas if it’s a gravity feed tractor; it’s very difficult to do that, even with a post-hole rammer attachment. "If you want to dig a hole for a post or for tree planting or anything, this tractor can do a very good job of that. "Our three-point linkage design also just makes it easier to line everything up when attaching implements." The other strength of the Ultra is its versatility, and the sheer number of attachments it can be fitted with. Everything from grader blades to rotary hoes, slashers, post-hole diggers, finishing mowers, road sweepers, wood chippers, chain harrows, and disc ploughs. "There’s just so much you can put on the back," Ozkaya says. "For the size, it’s probably one of the most versatile tractors around. "Because it will lift 600kgs at the front, and you’ve got your three point linkage at the back which is hydraulic down, as well as your two-speed PTO." The other thing people like about the Ultra, according to Ozkaya, is the fact that it has a shuttle-shift transmission, which operators find easy to use and convenient. "Many tractors have eight to 12 forward gears and only four in reverse," he says. "We have 12 gears forward and 12 in reverse. "Some tractors are difficult to get into reverse, depending on the set up of the gears, but the gears on the Ultra couldn’t be easier to operate really." He is also fond of the flat floor, which makes it easy to get into the driver’s seat and the roomy cabin with plenty of air flow if and when it’s needed. "The flat floor is nice because it means were not climbing over gearboxes," Ozkaya says. "There’s also plenty of room in the cab, more than most other compact tractors. "There’s nothing worse than driving all day in a stiffy cabin. This has a sun roof, a large rear window that opens right up on rear struts, and side windows to let the breeze through." The power-steering pump and hydraulic pump are separate, which means the power steering is not affected when simultaneously using the hydraulics. "In other tractors, because the two run off the same pump, it affects the power steering. But our design is smarter than that, and we have dedicated pumps for each function, so you can use both at the same time," Ozkaya says. The Ultra can be custom-configured to suit flat or hilly land applications, and it comes with a four in one bucket, a five or six foot slasher (depending on availability) and a four foot carry-all as standard for those who mention this FFM article. If you're looking for Agrison tractors for sale, check out our listings.